Today I am going to do the companion posting to the last one. 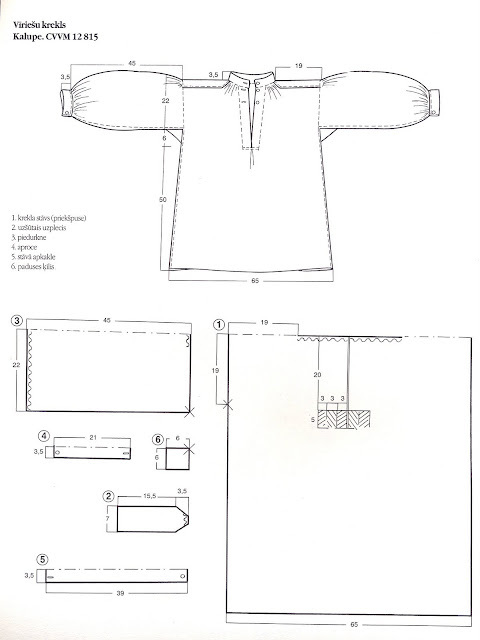 Men's costume in Latvia is not that different from region to region, but It would be good to provide what information there is to any who are seeking it. 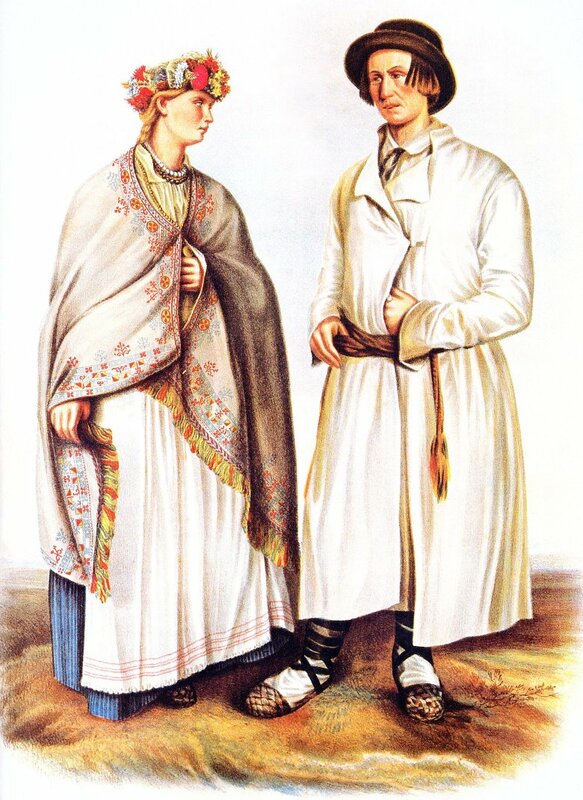 Latgale, as you may have figured out by now, is not the most prosperous of the Latvian provinces, and it was under the Russian empire for part of its history, so there is some Russian influence on the clothing, particularly for the men, who dealt with outsiders and travelled more. Here is a map of Latvia showing the 5 cultural provinces. 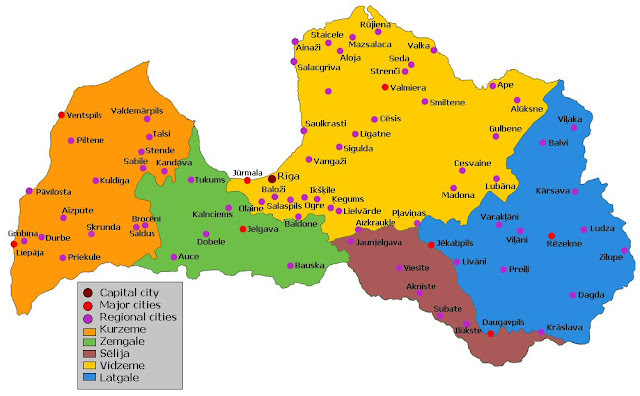 Latgale is shown in blue, Vidzeme in yellow, Kurzeme or Courland in orange, Zemgale in green, and Augszeme or Selija in rust. The differences are in part due to traits inherited from different ancestral tribes. Unlike the women's costume, there is no real distinction between North Latgale and South Latgale men's attire, except that after 1880 or so, some men's shirts in the north were highly embroidered. 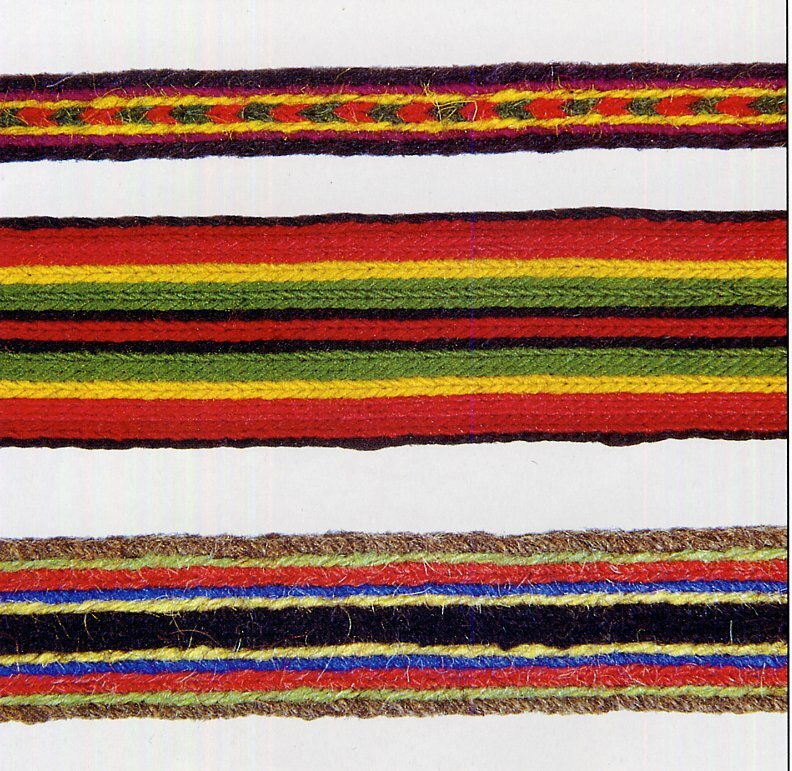 This was the result of cross stitch pattern books being published and widely distributed. 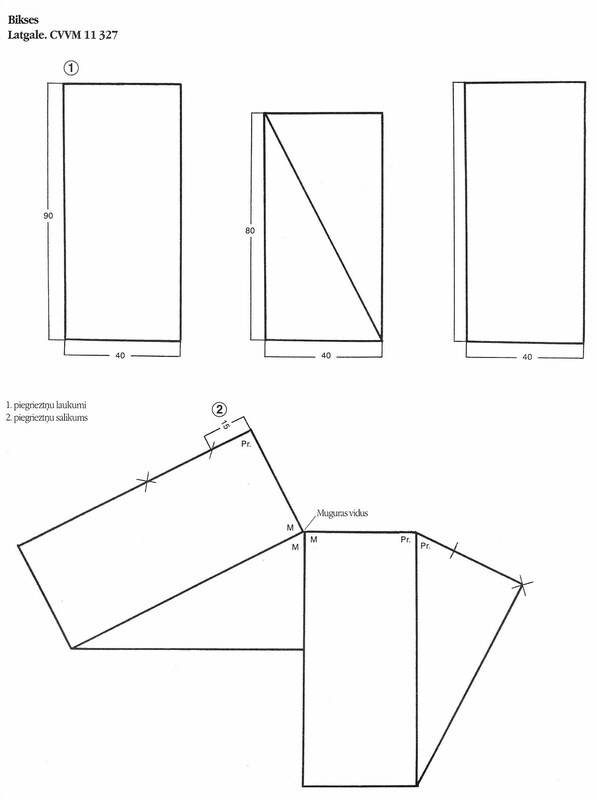 Here is a drawing from a book published in Russia in 1873. Black felt hat, linen shirt, long linen jacket [over a wool jacket? 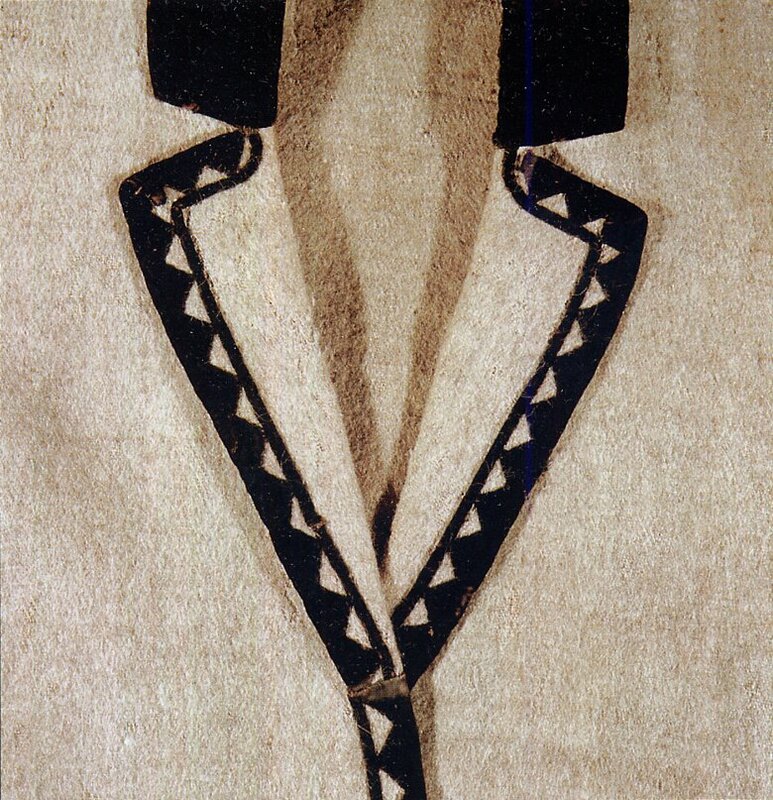 ], braided [finger-woven] sash, footcloths, vizes woven of bark with laces on the feet, presumably pants as well. 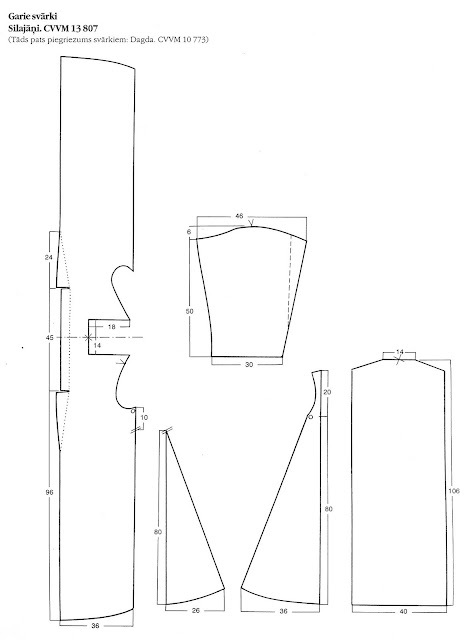 Here is another drawing, not nearly as well executed, but showing the costume. 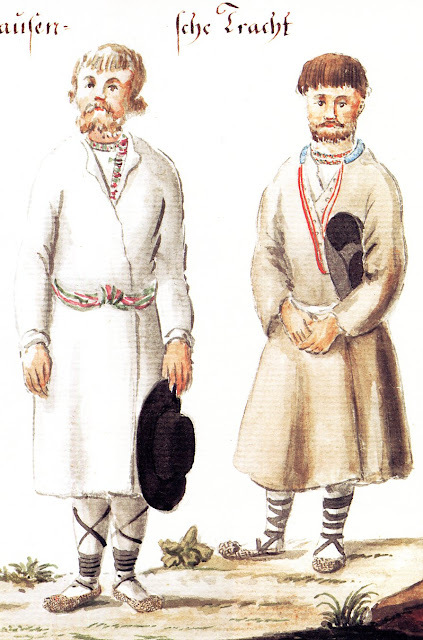 We see the same costume, one jacket seems to be wool and the other linen, The vizes seem to be woven of cord rather than bark, and both men are wearing Russian style shirts with embroidery and the opening on the left. Let us start with the shirt. 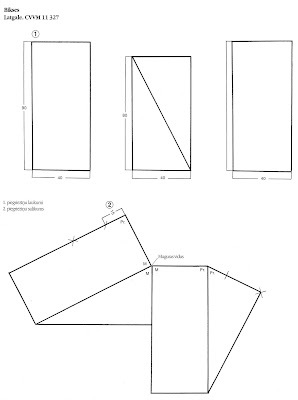 It is substantially the same cut as we saw in Courland. For young children, boys and girls both, this is the only garment they wore. 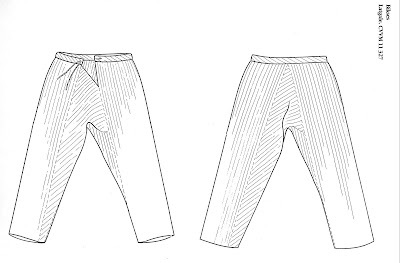 They were not given pants or skirts untill they were well out of diapers, around age 5 or 6. 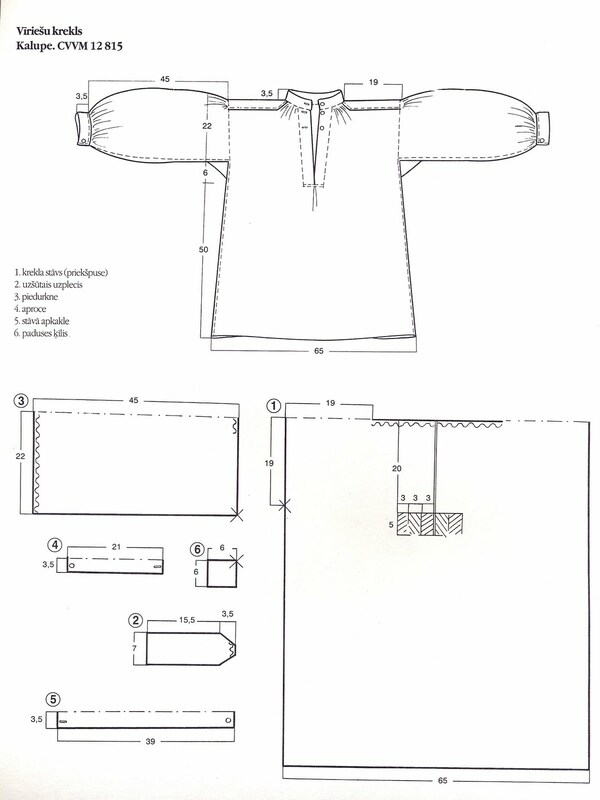 Here is the cut of one particularly fine shirt from north Latgale, but the cut is typical. Most commonly the shirt was not embroidered. 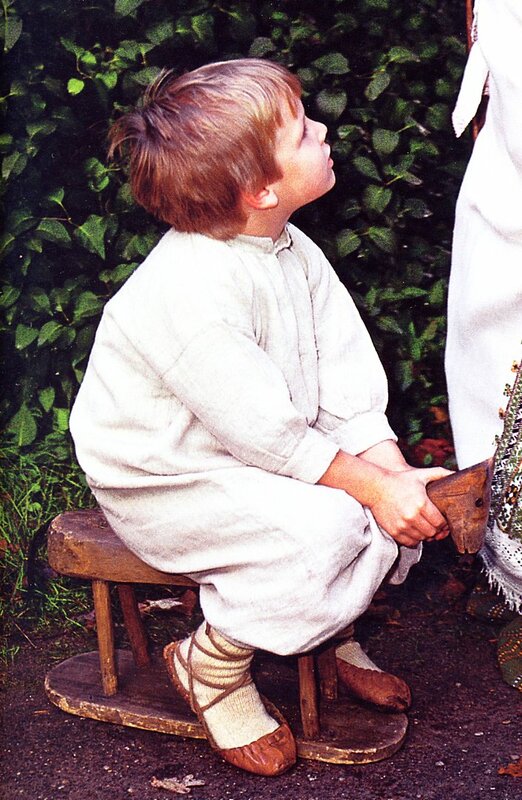 Here is a man from Skilbeni in north Latgale wearing this shirt, along with linen pants, knitted socks, pastalas [moccasins], straw hat,and a narrow card woven sash. 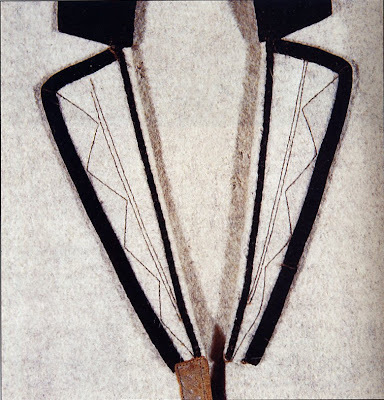 Russian men in the noth also tended to wear a similar very narrow sash. The cut of the pants was often quite simple. and sometimes a bit more complex. As the shirts were generally worn outside the pants, this was not very noticeable. Linen pants were worn for work and in warm weather. If a man could afford them, he would wear wool pants in cooler weather, or for dress. 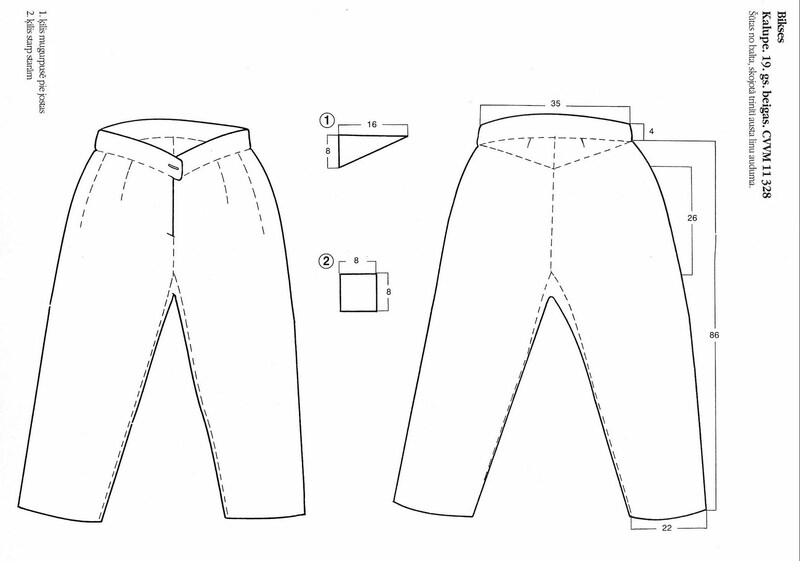 Wool pants tended to be of this cut below. Pants were always tucked into footcloths, socks or boots, unless, of course the man was working barefoot. 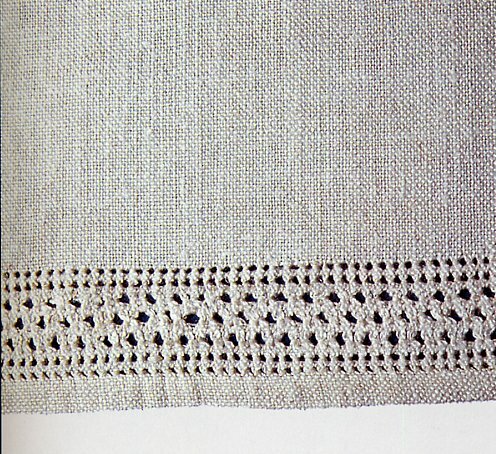 If you look closely at the man in the photo above, he has several rows of hemstitch on the hem of his shirt. and the cuff. Someone put a great deal of work into making this shirt special. 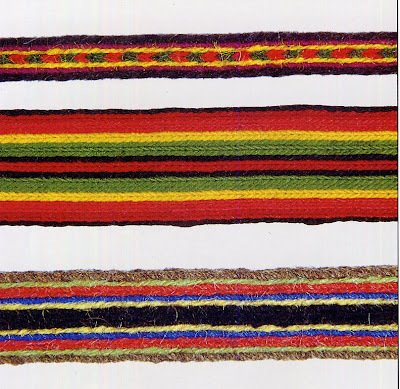 Here is a closeup of the narro card woven sash, worn only by men or used as laces for the footstraps. 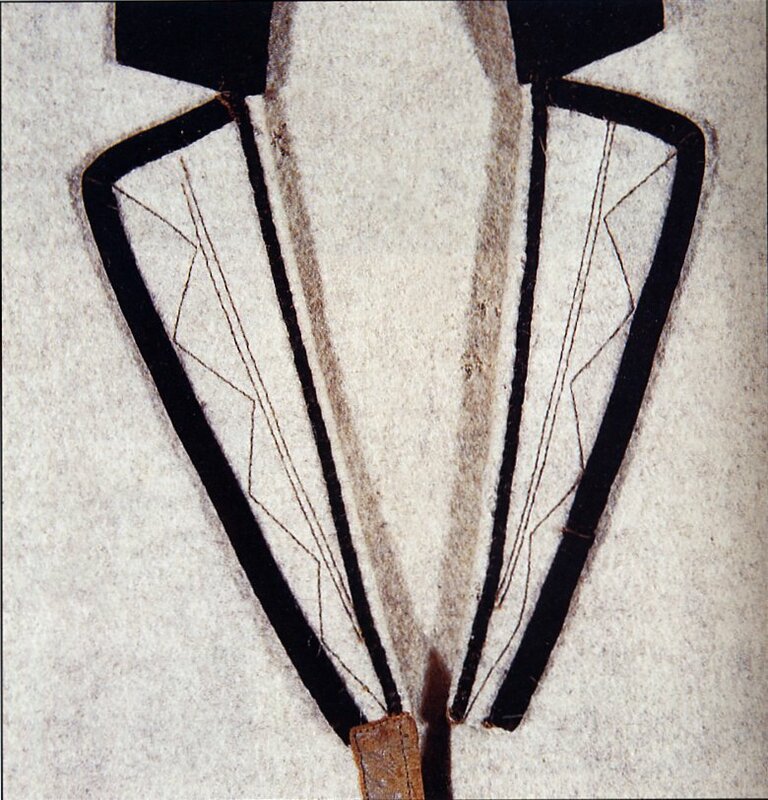 The wider ones below were worn mostly by women, or sometimes by men to hold jackets and overcoats closed. Here is a photo of a man from south Latgale. Plain white shirt, footcloths in this case instead of stockings, pastalas, straw hat and Russian style striped pants. Latgale men often went to find work in Russia, and Russian influence was strong. 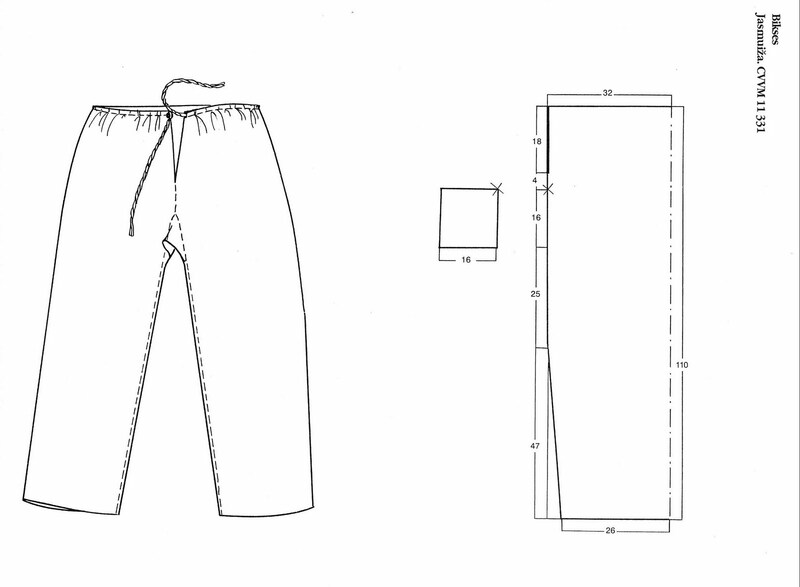 These pants are made of three rectangular pieces of cloth, usually striped. This cut is used all over north Russia, and by various of the indigenous peoples of the area. Here is a man from north Latgale in a long linen jacket, and a shirt that was embroidered with a design out of a cross stitch pattern book. He is choosing to wear his shirt tucked in, which may have been done in the westen part of Latgale, he is wearing a wider card woven sash, and is wearing pants of the more elaborate cut shown at the beginning of this posting. Here is a closeup of the embroidery on his shirt. 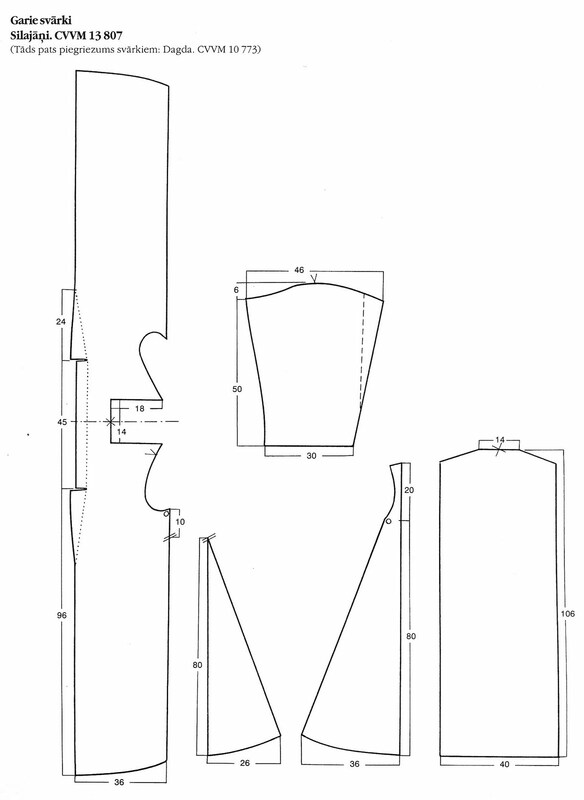 Any embroidery from standard cross stitch pattern books of the time would be appropriate. 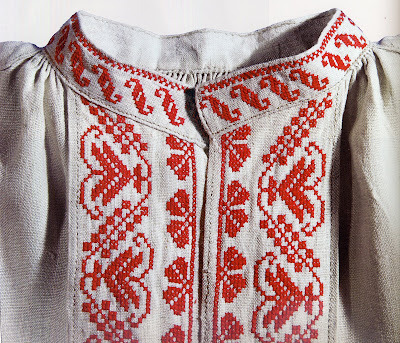 Similar shirts were worn in Belarus, and in parts of Estonia [Lihula]. The long jacket, in both linen and wool, is known from very large areas of Easten Europe, with a similar cut. 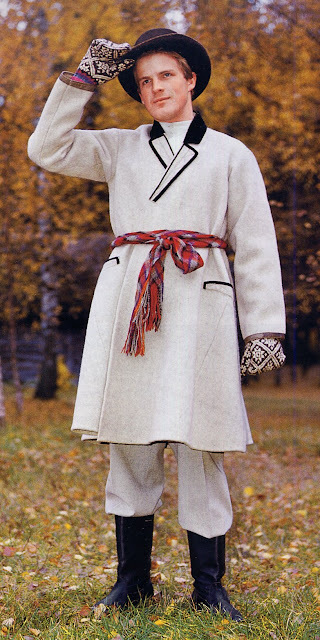 Here is a man from Dagda, in south Latgale, wearing a wool jacket, and all dressed up with braided sash, felt hat, boots and the famous Latvian patterned mittens. In Latgale he would be considered well off. 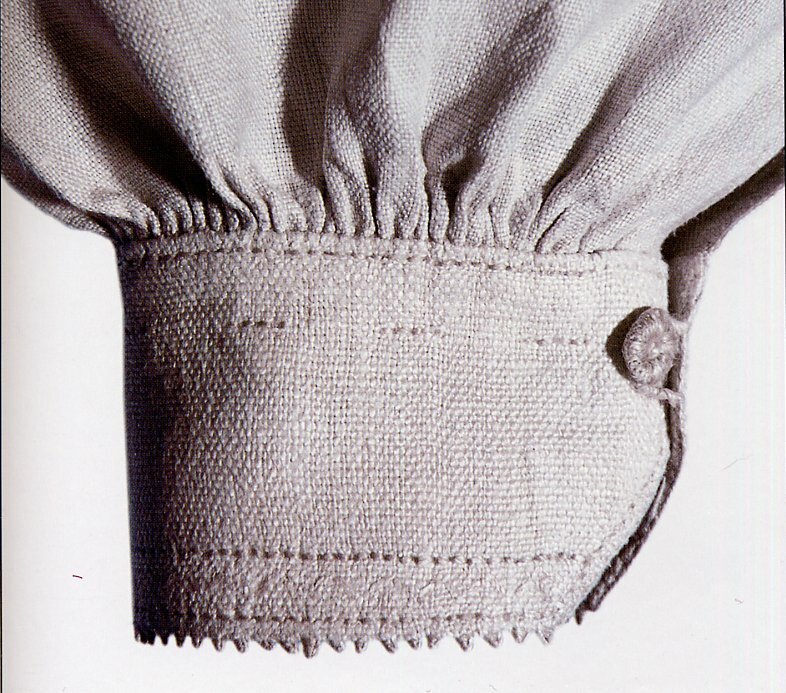 when made of linen, the jackets would be made of rectangular pieces, with triangular gussets under the arms, and rectangular sleeves sewn on at right angles, like the shirts. When made of wool, often they would be somewhat more fitted. The cut varied somewhat, but here is this one. 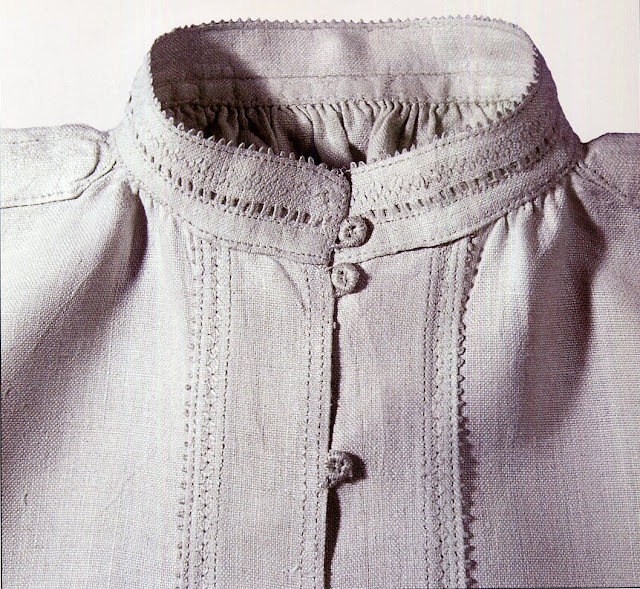 The jackets were sewed by hand, but afterwards, decorative stitching was often done by machine. 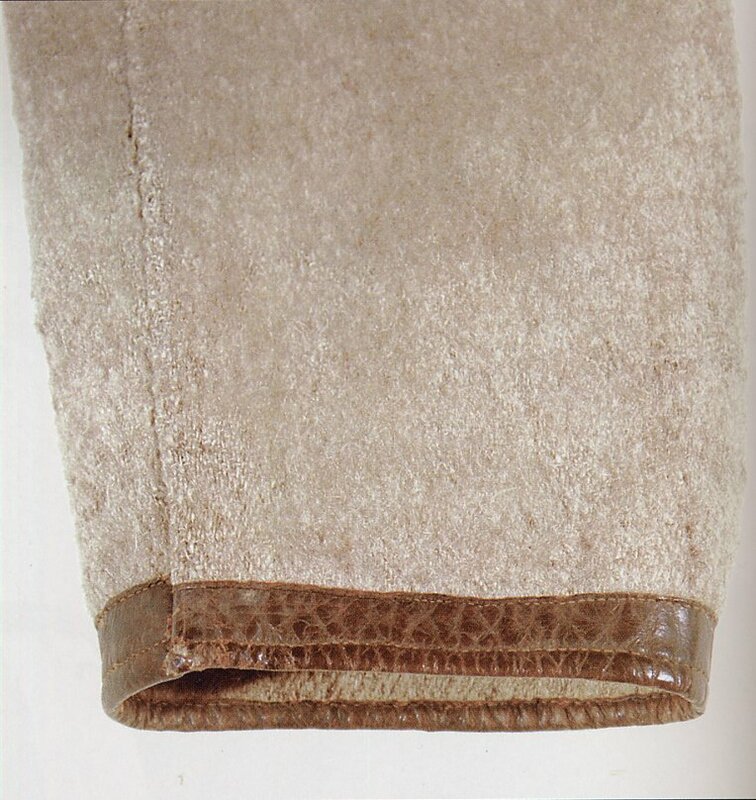 Black velvet and leather trim were also used. 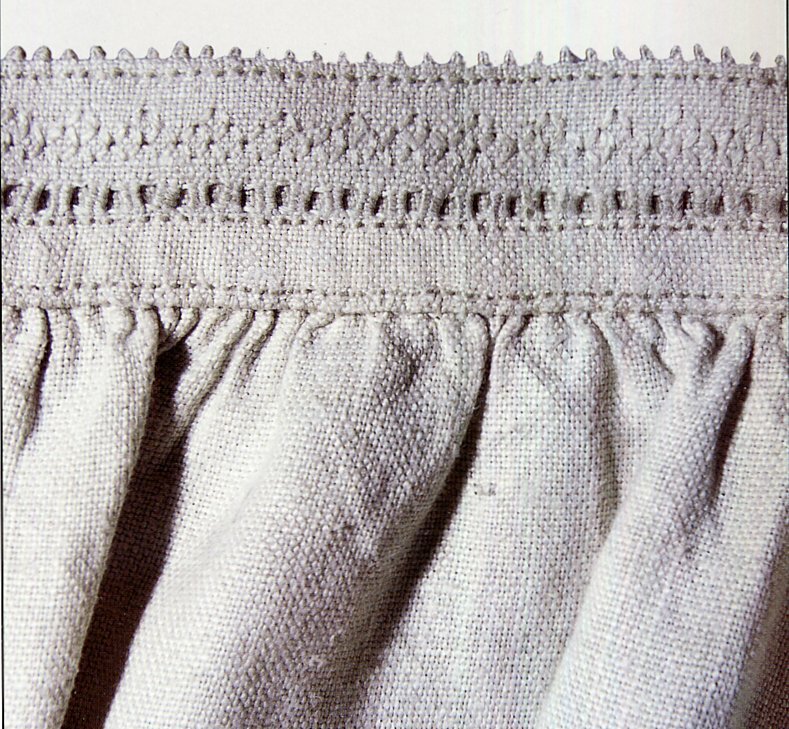 Here are closeups of two braided [finger woven] sashes. These are found over a huge area of Europe and beyond. In Latgale and Latvia in general, they are much more commonly used by men. Thank you for reading, and i hope you have found this interesting and useful. Hello, I discovered you via pinterest. You have a lovely, fascinating blog. Thank you for sharing your knowledge. 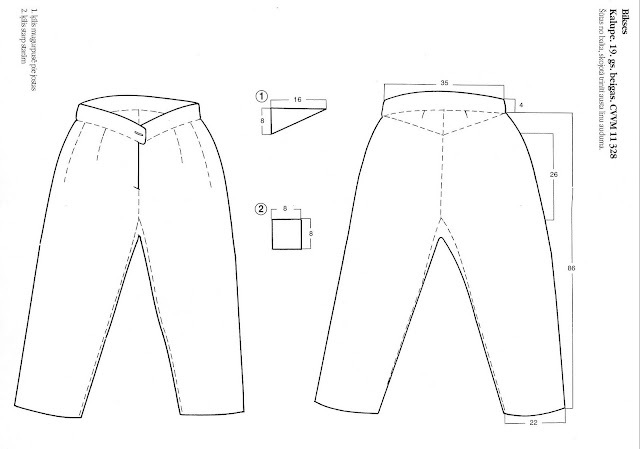 Hi, I was looking for easy patterns for young man to make some pants for my sons and acme across your blog! what a tresure!!! Greatings!